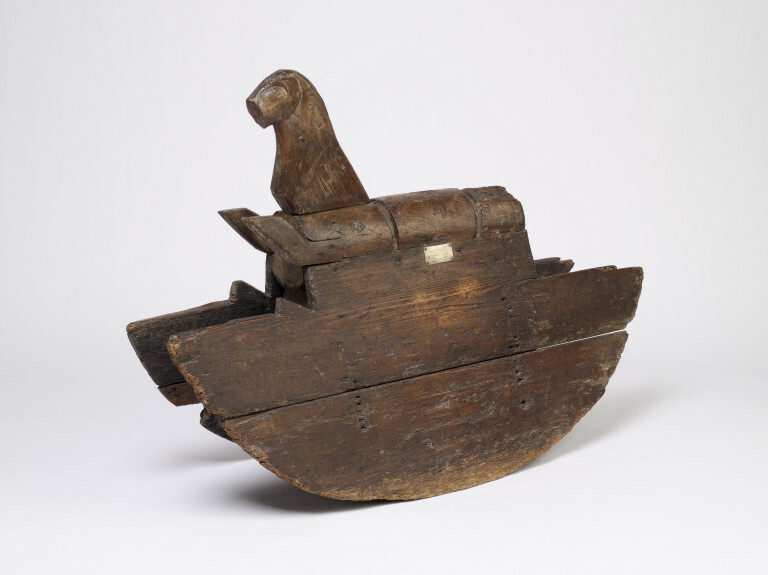 This acquisition is a seventeenth-century rocking horse traditionally associated with the childhood of Charles I, one of our most equestrian kings. Charles was born in 1600, the second son of James VI and I. He was a delicate child, with difficulties in speaking and walking, and the household accounts list the making of a type of wheelchair for his use. He was still unable to walk when his father created him Duke of York in 1605. Sir Robert and Lady Carey, his guardians between 1605 and 1611, arranged remedial treatment, and it has been suggested that this may have included a rocking horse to provide exercise and strengthen his legs. If this horse were his, it would probably date from 1605-08. By 1610 he had made great progress in mobility, and could walk, ride, take tennis coaching from Master Jehu Webb, and dance. There is apparently no contemporary record of a rocking horse for Charles, but intriguingly, a plaque attached to this one reads "Purchased on June 18th 1906 at Cheshunt House Hertfordshire". This was close to Theobalds Palace, a favourite residence of James I that was demolished in the 18th century. We can probably never prove or disprove the horse's royal associations: its significance lies rather in its early date and rarity. The body of the horse is caved from a single piece of elm, half the face and ears are missing. Its eyes and jaw line are carved into the wood. The front legs have been joined on but only half of each leg remains. All joints are butted together and joined with a nail and animal glue. The body sits on two rockers side panels, two large D shapes. 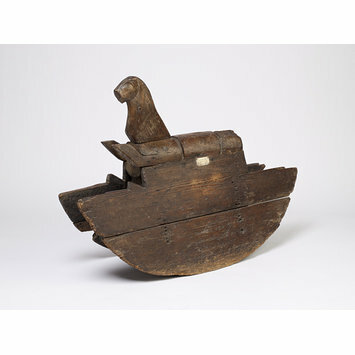 This rocking horse is one of the oldest surviving in the world. It has been suggested that it had belonged to Charles I. Though our reaserch we have been unable to prove or disprove this. But the fact remains that it is early as it is one of the oldest surviving rocking horses. It would be interesting to know the full history of the horse and why opinion has settled so firmly on a date of c. 1610 and an English provenance for it: both suggest a well-intentioned attempt to give credence to the legend that it belonged to Charles I. If that provenance is correct, the horse is likely to be slightly earlier than 1610. It may be English or Scottish. Charles I (born Dunfermline 1600) was the fourth child of James VI of Scotland and his wife Anne of Denmark, and effectively the youngest, as all subsequent children died in early childhood. He was a weak and sickly child, prone to fevers and insomnia, and also had considerable difficulties in walking and speech. Most historians agree that he probably had rickets (poor development of the bones, caused by vitamin D deficiency). This condition was possibly an inherited tendency from his father, and possibly also a consequence of his mother's insufficient nourishment through continual pregnancies. Rickets was apparently quite common in children in these islands in the seventeenth century. In 1647 Mary, Lady Verney wrote to her husband about their son John, born ca.1640 "For Jack his leggs are most miserable, crooked as ever I saw any child's…they lett him eate anythinge that he hath a mind toe, and he keepes a very ill diet"; Jack Verney also had "an Imperfection in his speech". The Accounts contain every piece of household expenditure, even down to the hire of transport to take New Year presents to the royal children in their separate households, but there is no mention of anything which could be interpreted as a rocking horse. Of course this does not preclude the possibility of its being a gift from outside the family. Despite an entry in the Lord Chamberlain's Accounts in February 1605 relieving Lord Fyvie of his "custody of Charles, Duke of York, with attestation of his being in perfect health", in England Charles's health and progress continued to give anxiety. When he was created Duke of York and a Knight of the Bath in January 1605 it was necessary to carry him on both occasions. Between 1605 and 1611 he was in the guardianship of Sir Robert and Lady Carey, who not only defended him from some of the more severe medical practices of the day, but took great trouble with his walking and speech difficulties. He had orthopaedic boots of leather and brass, and was taken to Edward Stutfeyld "An Artist for strengthening Limbs, and straitning crooked Bodies". A rocking horse could have been provided for him at this time, although not as late as 1610: it is extremely unlikely that any boy in an aristocratic or royal family at this date would still be playing with a rocking horse at nine years old. But in any case, by 1610 Charles had made great progress in his mobility. He rode real horses, danced and played tennis ("Warrant to pay 20£ to Jehu Webb, Master of the Tennis Play, for teaching the Duke of York to play at tennis" Lord Chamberlain's Accounts, Nov 28 1610). Again, no equivalent entry exists in the Lord Chamberlain's Accounts for providing anything which could be interpreted as a rocking horse. Given the necessarily approximate dating, may the horse have been for another royal child: Charles II (born 1630) rather than Charles I, for example? Claud Blair has recently shown that a suit of armour at HM Tower of London, long described as made for Charles I, was made for Charles II. The horse has a plaque which states that it was "Purchased on June 18th 1906 at Cheshunt House Hertfordshire". The provenance of Cheshunt (Great) House makes no direct link to the Stuart family, and Cardinal Wolsey (who died in 1530), both cited by one of the agents involved in the purchase, has no bearing on the matter. If the horse belonged to any of the royal children, it may have been kept at Theobalds Palace, which is just under two miles away. Theobalds, formerly in the Cecil family, was a favourite residence of James I , particularly for hunting purposes, and it was there, not at Cheshunt Great House, that he died and Charles was proclaimed king (also mis-stated by the agent cited above). In 1650, towards the end of the English Civil Wars, Theobalds Palace reverted to the Cecils. It was sold and largely demolished for rebuilding in the early 18th century, and it is quite possible that items from the palace found their way into the other large houses in the area, of which Cheshunt Great House was one. According to both the Hertfordshire County Archivist and the curator at Lowewood Museum (which deals with the history of the area) there is no record of a sale at the house on the date stated, in which case the purchase was probably a private one. For an object in private ownership, the horse has been very visible for the last century, and is very well known. It is said to have been seen at Syon House, the V&A, and Woburn Abbey as well as at Cheshunt Great House. In conclusion, it will clearly be as impossible to prove the association of Charles I with this rocking horse as to disprove it. Its importance lies rather in its age, rarity and singularity.